Dr. Brian Burks at the Fox Run Equine Center in Apollo. When horse trainer and riding instructor Lori Uretta was at a horse show in Ohio, she had to make one of two choices when Bob, her American saddle horse, got sick. "I could send him to a place an hour and a half away for treatment, or I could send him to Dr. Burks, who was three hours away," said Ms. Uretta, of Hermitage. Brian S. Burks, a veterinarian who runs Fox Run Equine Center, Washington Township, is the only veterinarian in Western Pennsylvania who is board certified by the American Board of Veterinary Practitioners as an equine specialist. He treats horses of all backgrounds -- race, show and pleasure -- that people bring from not only Western Pennsylvania, but West Virginia, Ohio, and New York. The center is open 24 hours a day, seven days a week for routine care as well as emergencies, such as the one Ms. Uretta was facing with Bob's severe stomach problem. "I opted to send the horse to Dr. Burks, even though it was farther," she said about having to drive back to Pennsylvania from the show. "He is my first call for any type of procedure that my horses may need." As it turned out, Bob was treated at the clinic for five days without needing surgery, and there were no complications. "We get a little bit of everything here," said Dr. Burks, of Delmont. "Our primary mission is to be a referral, so we get the difficult stuff. And very seldom do I refer anything away from us." Dr. Burks first worked as a veterinary assistant in California. He graduated from Oklahoma State University's School of Veterinary Medicine. He did his internship in Missouri, and later came to work at the Fox Run Equine Center, which Dr. John Leonard founded in 1984. Equine care is a very specialized field. Board certification requires years of practice and case hours, plus involvement in national high-level equine conferences. The applicant must write two case reports for review, then take a two-day long written exam. "It's a very grueling process and you always have to show continued education," Dr. Burks said. "They require all this because they want to see that you have the skills to do the more difficult cases." The center, which he took over last year, has 22 stalls, an intensive care unit and isolation, and state-of-the-art technology and equipment that enables veterinarians to offer a wide range of treatment that peers can't do on farm calls. There are some of the same kinds of specialized treatment that humans can receive in hospitals, such as for renal, endocrine and digestive disorders, respiratory and cardiovascular disease, cancer, infectious diseases, and more common ailments such as lameness and eye problems. Dr. Burks also offers regenerative medicine, where he harvests a horse's adipose (fat) tissue and sends it off to a lab to isolate stem cells that are injected to treat tendon injuries or degenerative joint disease. Injuries also can be treated with extracorporeal shock wave therapy. For diagnoses of those and other conditions, the center has an on-site laboratory and state-of-the-art equipment for digital radiography ultrasonography and nuclear scintigraphy (bone scans). "Say we do a bone scan. We have the best equipment on the market that gives clear pictures," Dr. Burks said. "If that doesn't cut it, we can move onto something like a nuclear scan. On the other hand, if a horse has diarrhea and they need fluids, there are lots of other diagnostics that you can't do on the farm. In my house lab, I can have blood work back in fifteen minutes." He performs house calls, too. Usually, they are only an hour away, although he has gone farther at times. "Eighty percent of what we do is in the hospital," he said. "I see about 100 to 150 horses a month, depending on the month, and 20 to 30 percent of the horses end up being admitted." Dr. Burks recently had a zebra as a patient and has treated some of the larger cats at the Pittsburgh Zoo. Earlier this year, he treated a horse that is a reserve world champion from Kentucky. "They flew me down to work on him," he said. "The client had a lot of respect for me, and it was cool to be able to do that for her. "I just love helping the horses, and making them better and seeing them go home. Whether it's [for] a 50-year-old woman or a kid with his first horse, I really like to turn [the animal] around." 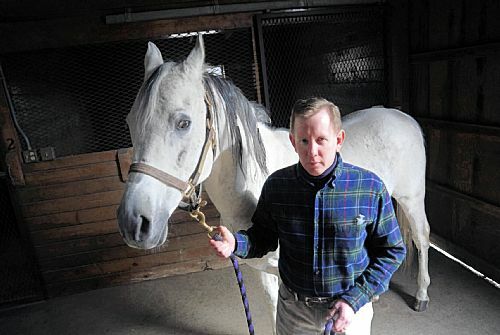 For more information on Dr. Burks and the Fox Run Equine Center, go to www.foxrunequine.com or call 724-727-3481. Freelance writer Sarah Eidemiller can be reached in care of [email protected].